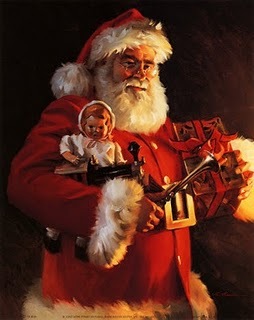 Brent and I have recently had many discussions as to how we want to handle Santa Claus around here. We want Lily to be more excited about the birth of Jesus than Santa Claus. So do we just ignore the jolly man, do we include him and let her find out when she’s old enough that he isn’t real, or do we just tell her from the get go that he isn’t real but still imagine that he is? We decided we can’t ignore him. It’s impossible in the culture we live in. A child has such a wonderful imagination that is God-given. To not even mention his name would be to steal from her an imagination that is meant to glorify God. Our parents did such a wonderful job of making Christmas about Jesus, but still incorporating Santa Claus into the gift-giving. I have so many wonderful memories of waiting in the hallway with Ben–for what seemed like days–for Dad to get the video camera set up before we ran into the den to see what Santa brought us. One Christmas he brought me a Sony CD Player with my first CD “Songs from the Loft” which had songs by Amy Grant, Michael W. Smith, Sandy Patty, etc. I nearly killed my brother (who was only 2 or 3) when I first saw it. Couldn’t get to it fast enough. I used to love “hearing” the reindeer on the roof. It’s funny what your imagination has the ability to do–convince you that something is real. Even after I didn’t believe anymore, I still heard Rudolph on the roof. We’ve decided we can’t tell Lily he is real and let her find out later that we’ve been lying to her. That would do such harm to us telling her about Jesus, who she can’t even see. With a lot of thought and after reading this article, we are going to tell her the history of St. Nick. We will explain to her that he was a Christian that served others and faithfully loved Jesus. He also liked to give gifts to other people. His death marked the St. Nick holiday where people began to give gifts to each other in his memory. That holiday is so close to Christmas, that it eventually became a Christmas tradition. We give gifts to others because we have received the ultimate gift, a Savior. We will allow her to imagine and pretend he is real. We will go to the mall and get pictures with Santa, we will leave cookies out for him on Christmas Eve (another excuse to bake and eat cookies), we will read ‘Twas the Night Before Christmas, and listen for the reindeer on the roof. She will imagine the fanciful, but most importantly, she will know that the God we serve became a human named Jesus, who was tempted in all ways but was without sin, who suffered death on a cross so that she may be saved from the sin that entangles her, who is risen and has given us the Holy Spirit to reside in our hearts. We will make Him a birthday cake, sing happy birthday, read the Christmas story, and celebrate His gift, not our gifts, on Christmas Day. Don’t you think that’s what St. Nick would want anyway?